Campbell Engineering specializes in producing highly complex, low-volume components, primarily for medical devices. The Lake Forest, Calif., company began to experience growing pains after transitioning its operation from that of a contract machine shop producing prototype parts to functioning more as a full-service production operation. To meet its new business opportunities, Campbell needed to increase capacity without adding labor. For years, it had been using commodity vertical machining centers. Though that approach had worked for a while, it now needed to obtain high-performance machining centers to better manage its expansion and to meet its quality requirements. Owner Jay Campbell talked to his brother Larry at AFAB Precision Machining about how his company had increased productivity during a growth spurt years earlier. Larry suggested that Jay contact SST to discuss options for high-performance machining centers from Makino. Impressed by the response and knowledge of the SST representative, Campbell obtained a PS95 vertical machining center and a51 horizontal machining center. The California company knew it couldn’t go wrong with the production capability of the PS95, and it was excited about the a51’s capabilities for combining operations and improving quality. SST served as a single source for both machine installations and also suggested that Campbell add a TechniGrip™ work-holding system to the a51. 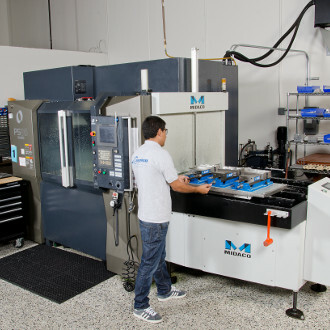 Both high-performance machining centers have enabled the company to not only expand capacity but also cut parts 60 to 70 percent more aggressively than the other machines on Campbell’s shop floor. The a51 led the company to combine operations and improve quality, meeting true positioning of 0.001 inch on parts with as much as eight operations. It has become the company’s go-to solution when it needs to machine a part complete and for parts requiring three or more operations. The rigidity of the machine has also decreased tool wear. Moreover, it is repeatable and accurate. The PS95 handles the company’s larger applications requiring limited operations or roughing—typically those with high metal-removal rates and true positioning of 0.002 inch. Previous commodity machines needed to frequently sit idle to cool down so the company could hold tolerances, but Campbell runs the PS95 for hours while maintaining true positioning. This improved accuracy has helped the company reduce scrap and perform fewer article inspections. The company says the PS95 has equal performance to two or three of its previous spindles, and Campbell appreciates the speed of the tool changes and the machines’ rigidity. For example, on one particular part that was completed on the PS95, cycle times dropped from 42 minutes to 25 minutes with improved repeatability. Not only have cycle times dropped with both machines, but Campbell has also been able to run additional volumes, meeting capacity requirements.